A chemical engineer and former NASA flight controller, Caroline Kostak talked to club members about RePurpose Depot, a company that specializes in the recovery of previously used material. Caroline is a Green Building Consultant, a TRP Houston Area Representative, and Vice Chair of US Green Building Council, Texas Gulf Coast. Caroline’s talk was about why we should reclaim building materials and defined waste as a resource in the wrong place at the wrong time. Showing numerous statistical charts of what and how much goes into landfills Caroline then showed club members how building materials from construction and remodeling scrap to toilets and tubs can be recycled, reclaimed and repurposed into somewhat very much useable. Caroline spoke of the challenges involved in repurposing material, for example, the time required to denail wood vs the selling price or price the public is willing to pay. Storage is an issue as well as having precisely what the public wants. RePurpose Depot is located at 305 McFarland St, Houston, TX, 77011, (only 2.1 miles from the Original Ninfa’s on Navigation), phone 832-215-3885 and email, Caroline.kostak@gmail.com. A couple of felled cedar trees provided contrasting cedar heart and sap wood for Bill Lindsey’s two cedar chests finished with tung oil and a coat of wax. Bill designed his own lid mechanism so that the lid sits just behind the chest and won’t fall down on your fingers. Our Lady of the Harbor shines her torch in various forms from Bob Wink’s story boxes and folk art depictions of the Statue of Liberty. Norm Nichols crafted a cross of aromatic cedar infused with turquoise and epoxy. Norm elicited comments from members who suggested to keep adding extra solids until you get a paste. If prime ingredients are expensive you can use “invisible” glass beads for additional solid material. Wanting to learn carving, Rich Bajenski, after researching the Internet for ideas, realized he need something more substantial. So Rich crafted a benchtop platform replete with devices to mount clamps and hold-downs. A walnut end table hand crafted by John Lastrapes became a gift for his wife. John’s wife gifted to him a class at the Lonnie Bird Woodworking School in Tennessee that was five rigorous days of classes in woodworking with hand tools. Out of scrap bodark Sam Grice turned some cups. Also, Sam ran some cedar and treated pine board pickets through a planer, ripped to width and made a porch swing. Because of the moisture in the wood Sam disabled his Sawstop sensor – yup – the light was blinking – he didn’t want a $50 swing to turn into a $250 swing. After attending Steve Good’s talk about using vinyl sheets he cut nine pieces of vinyl with 8mm ply for support. He was able to transfer the designs onto boxes to decorate and jazz them. 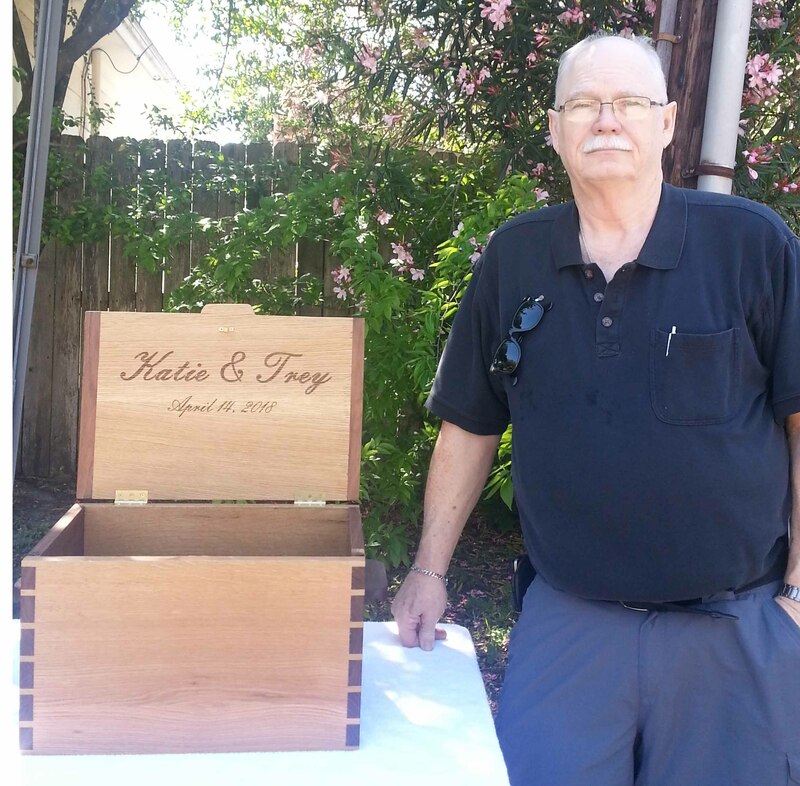 A beautiful wedding box of white oak and walnut was crafted by Ben Tillison for his daughter’s wedding: the theme – out of two cut one. Club member Lynn Cummings laser engraved the lid. Ben finished with tung oil and coated with bowling alley wax. Using repurposed fir from a church renovation, Ron Taylor crafted toys that he finished with AFM Safecoat wood sealer. George Graves showed club members examples of puzzles that he made to give away. The six piece shape puzzle in particular was made for a child who had his arm removed because of cancer. One scroll sawed pattern came from a Steve Good design. George is up to about 550 toy cars so far. In Peter Doe’s office there is a painting of a live oak tree. Peter wanted to mimic the picture for his bookcase so he took various species of wood and crafted them into veneers. Peter used a vacuum veneer press and veneer glue to affix the pieces to the substrate.